How much does it cost to travel to Edinburgh? How much money will you need in Edinburgh? £110 ($144) is the average daily price for traveling in Edinburgh. The average price of food for one day is £25 ($32). The average price of a hotel for a couple is £119 ($155). Additional pricing is in the table below. These average travel prices have been collected from other travelers to help you plan your own travel budget. How much money do I need for Edinburgh? Edinburgh is the moderately sized capital of Scotland. It is a medieval city that has managed to perfect the combination of Georgian architecture and medieval relics with a cosmopolitan population and avant-garde atmosphere. The city's population is quite young, in large part because of the University of Edinburgh. This youthful vibe gives this city a lot of vitality. There's a thriving nightlife, many restaurants, theatres, galleries and museums. Edinburgh's climate is most enjoyable between the months of May and September. Throughout the year, the weather is prone to sudden changes and you can expect both sunshine and rain at any given time. Rainstorms often come with wind, so it can be chilly, damp, and generally unpleasant all at once. During the summer months, when tourist crowds are at their peak, daylight hours are long and the temperature is comfortable. During the winter months days are short and the weather is bitter cold, but snow is rare. It's best to spend time enjoying Edinburgh's many indoor activities during the winter months. The main sight and iconic structure in Edinburgh is the Edinburgh Castle. It's situated dramatically on the highest point in the city and remains in excellent condition despite its continuous use for the past 1000 years. Also worth visiting is St Giles' Cathedral, Gladstone's Land, and the Royal Botanic Garden. Most sights are concentrated in the Old Town and New Town areas. There are also many museums and art galleries that are worth checking out. Most tourists spend the majority of their time in Old Town. This is the medieval heart of the city and it runs from the Castle to Holyrood Palace. New Town is also in the city center and it dates back to the late 18th century. This is where you want to go for the city's best shopping opportunities. There's also some interesting shopping to the north of New Town in Stockbridge and Canonmills. This is also where you'll find the Royal Botanic Garden. Leith is the port area and the beach district is to the east of the city. To the south you will find a high concentration of students and plenty of places to eat and drink. In the west is the zoo and Murrayfield rugby stadium. There is almost a constant stream of festivals in the city for anything from comedy, to jazz, to literature. There's actually a festival season in Edinburgh which begins with Hogmanay, or the Scottish New Year. The peak festival season is during the summer when weather is at its best, the crowds are the highest, and the festivals are quite popular. 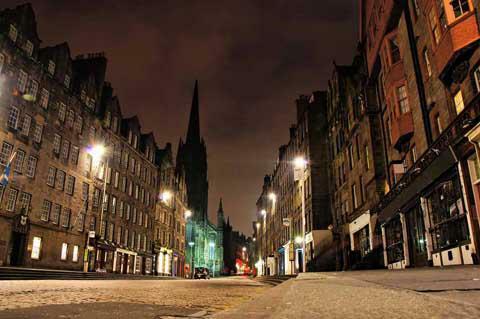 Nightlife is also a huge draw in Edinburgh. For modern and trendy clubs, head to Cowgate and Lothian Road. George IV Bridge in the Old Town area also offers some trendy clubs. While there's some big name clubs that many people want to hit while they're in Edinburgh, you may actually have your best night if you pop into a little known corner pub and make yourself at home. This is how you truly get to know a city. If you're in Old Town, don't forget to check out a ghost tour of Edinburgh in the evening before you head out to the restaurants and bars. Restaurants in Edinburgh are quite good and international. Like most cities, it's best to avoid eating in the touristy areas, particularly around the castle, but if you head into the local neighborhoods you'll be pleasantly surprised with your selection. In addition to eating in the city center, you can also head to Leith and the West End for some good restaurants. There's a pedestrian area along Rose Street that runs parallel to Princes Street that also has some good pubs. Drinking in Edinburgh is part of the experience. There's truly a pub culture in this city, and it's something you really want to experience while you're in town. As with restaurants, it's best to avoid the tourist traps, but there are some great pubs around town, particularly in the university area. The best way to navigate Edinburgh is on foot. It's a compact city and you'll find most of the points of interest in the Old Town, with a few nearby in the New Town. Walking around Edinburgh also gives you a feel for how historic this city is. It's laid out as a city to be walked through, and to this day that is the best way to explore it. There are some hills that may make some of the walks slightly more strenuous. The public transit system is heavily dependent on buses and is much less developed than most major European cities. The buses can be slow and inefficient because they must deal with the city's heavy traffic. There is a suburban railway network but it is also insufficient and sparse.